Hometown Christmas Memories and other artwork by artist Thomas Kinkade can be viewed in our artist slideshow. 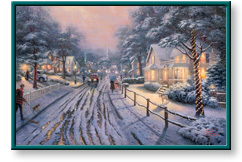 Hometown Christmas Memories by artist Thomas Kinkade and other Thomas Kincade art, art work, artwork, canvases, giclees, images, limited editions, open editions, paintings, paper, pictures, posters, and prints can all be found at Christ-Centered Art. "Early in my career I created Hometown Memories as a nostalgic embodiment of the images of my childhood. "The current offering recreates that painting but with the blaze of holiday light. A freshly fallen snow has rendered the village lane pristine. The luminous radiance dancing upon the ground and the twinkling glow from the holiday decorations reminds us that Christmas is truly the season of lights. "I believe that everyone has a dream hometown buried somewhere in their subconscious. Hometown Christmas Memories recreates the fondest aspects of my childhood hometown dream." Hometown Christmas Memories by artist Thomas Kinkade as well as other open and limited edition inspirational paper art prints and canvases, giclees, images, lithographs, paintings, pictures, posters, and reproductions by renowned Lightpost Publishing, Media Arts, and The Thomas Kinkade Company artist Thomas Kincade can be viewed and purchased at special sale prices at Christ-Centered Art.